Air traffic controllers at the Federal Aviation Administration work shifts that cause fatigue and poor performance on the job, according to a new report. The National Research Council detailed a litany of concerns with FAA’s staffing and scheduling processes, noting some policies create safety concerns. The researchers suggested the agency modify the way it makes staffing decisions to ensure it has enough employees to meet its needs. Many air traffic controllers take five eight-hour shifts over the course of four days, as it allows them to subsequently take 80 hours off. To work that much in such a confined timeframe, however, often leads to “sleep deficit.” The effect is multiplied as this schedule requires controllers to work their final shift late at night, in what is known as the midnight shift. “This combination of acute sleep loss and work during the biological night increases the risk for fatigue and for associated errors and accidents,” the NRC said. Researchers called the practice “questionable,” and said they were “astonished” it was still allowed. FAA has established a “fatigue risk management system,” but budget cuts have reduced its effectiveness. The report recommended the agency work with the National Air Traffic Controllers Association to implement a new schedule that better accounts for fatigue. Part of the issue stems from a lack of guidance from the FAA headquarters, the report said. Each facility is left to develop its own schedule “independently of FAA’s staff planning process.” Staffing levels and schedules, therefore, may not reflect best strategies for fatigue management or cost effectiveness. The report also found FAA is not utilizing all the data it has at its disposal to measure potential shortfalls. 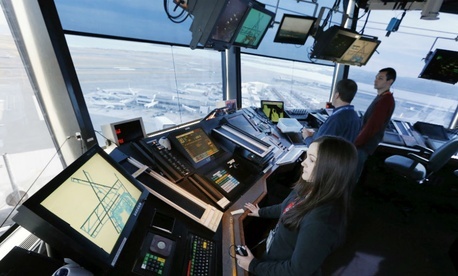 Researchers found “no systematic or proactive mechanisms within FAA to analyze data relative to staffing levels.” In addition to using existing information, agency management should involve air traffic controllers in conversations to assess their concerns, the report said. Pritchett added FAA’s concerns are exacerbated by an upcoming wave of retirements at the agency. More than one in five air traffic controllers were eligible to retire at the end of fiscal 2012, and it generally takes years to train a new hire.